The Very Loooooong Cave is the fifth level of World 6 in Super Mario World 2: Yoshi's Island and Yoshi's Island: Super Mario Advance 3. The level starts out in a cave. The screen begins to scroll, forcing the player through traps such as Lava and Chomp Rocks. During the very long descent, the Yoshi encounters many Lava Drops and Boo Guys before having to ride a few Flatbed Ferries. Purple Yoshi starts out near two small lava spots on the ground, and a Lava Drop. Accompanying the autoscrolling screen, Yoshi will find Icicles on the ceiling, which can harm him if he is not careful. He will also find here a pipe spawning Boo Guys, and a Chomp Rock. Yoshi will have to jump over lava spots, while dodging Icicles and Flamer Guys. A Flower can be found above one of the lava spots. Next, Yoshi will find a Winged Cloud, some Boo Guys and Lava Drops, and eventually a Fly Guy holding a Red Coin. A Chomp Rock will start to roll in Yoshi's direction, which pushes him to the nearby lava spot in the ground, where Yoshi can use Flatbed Ferries to reach the other side. Another Fly Guy holding a Red Coin will appear, as well as a Flamer Guy. Next, the screen will start to scroll up, and Yoshi will have to use several platforms to progress. Another Flower can be collected among the platforms. Boo Guys, Chomp Rocks, and a single Fly Guy will appear to hinder the player. The Fly Guy, however, holds a Red Coin. Next, the screen will scroll to the right, and Yoshi will find a Lava Bubble jumping in and out of a lava spot in the ground. Yoshi must to dodge Boo Guys and Lava Drops. In order to jump over a large lava spot, Yoshi will have to hit two icicles in the ceiling with eggs. 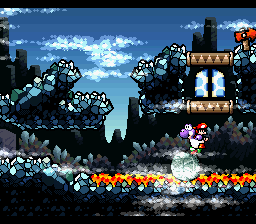 A Chomp Rock will suddenly fall off the top of the screen, which Yoshi can use to cross a lava spot. A door can be found between two platforms, leading to a corridor with a Middle Ring, an Egg Block, and grey walls that can be destroyed with eggs. There are also many invisible Winged Clouds in this area, often giving out coins and 1-Ups. Yoshi will eventually find a watermelon in this area, allowing him to spit seeds that can destroy the grey walls with ease. In the end of this area, Yoshi can collect Red Coins and a Flower. The next door will lead him to a small maze-like area with Flightless Skeleton Goonies, walking one behind the another in an attempt to harm Yoshi. These foes, however, will be defeated by a Chomp Rock. The next area involves Yoshi jumping in several small platforms, with Chomp Rocks falling from the top of the screen, and ground pounding posts, where Red Coins are hidden. Right after this, Yoshi will find the goal. French La Grotte Interminable. The Interminable Cave. The level The Cave That Never Ends from Yoshi's Island DS is similar in both name and design to The Very Loooooong Cave. This page was last edited on April 9, 2019, at 02:40.